I finished I Love Ewe by Mill Hill. I also finished my fourth block for the 2020 Crazy Quilt Challenge. Do you have any finishes for June? Well, I didn't get 1200 stitches for the month. I did get some stitching in and I love how it looks. Hopefully I can stitch on this a little in July. Are you working on a full coverage piece? I had some time, so I stitched. I did a lot of coral knots and started some needleweaving. If I have some time, I hope to stitch on this more today. First, thanks for all the lovely comments on my Drawn Thread Sampler. If I die before you Cheryl, you may have it as a stencil. I will let my kids know. I have totally messed up my rotation by thinking, like the crazy woman I am, I could add Uncle Sam's Hat into the mix. Bad idea! I must stitch using my frame and lay the threads carefully. But I love it and would rather stitch it than anything else in my rotation. It is so much fun! BUT, I must get Drawn Thread done! This weekend I worked on Uncle Sam instead of Reptiles. I will work on Drawn Thread this week and pull Reptiles out this weekend. Which means Uncle Sam will NOT have a hat by the 4th of July. Oh well. Maybe by 2019? How do you decide what to stitch? Oh! Jo, I am still trying to get photos for all the postcards that I make. Will post about it soon. 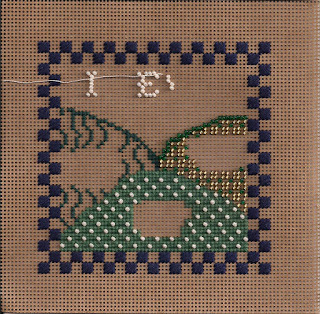 I worked on my Drawn Thread Sampler by Gay Ann Rogers. I feel like I made some progress. This piece is challenging. It is stretching me. I am learning a lot. Is it perfect? No! Do I care? No! I think it is fun watching the patterns develop, but I look forward to Friday when I hope to work on Uncle Sam's Hat. I was tired of white work and all the greys on my Reptiles, so I spent a lot of time on Uncle Sam's Hat. The next stripe had Neon Rays in it. I love Neon Rays! I hate Neon Rays! I could not get my stitches smooth.I tried wetting the thread. That did not work. Sigh. Then I remembered a talk with Gary Parr and Christine Williams on Fiber Talk . They suggested ironing the thread with a flat iron. After a little talk with my dd, I located my iron. 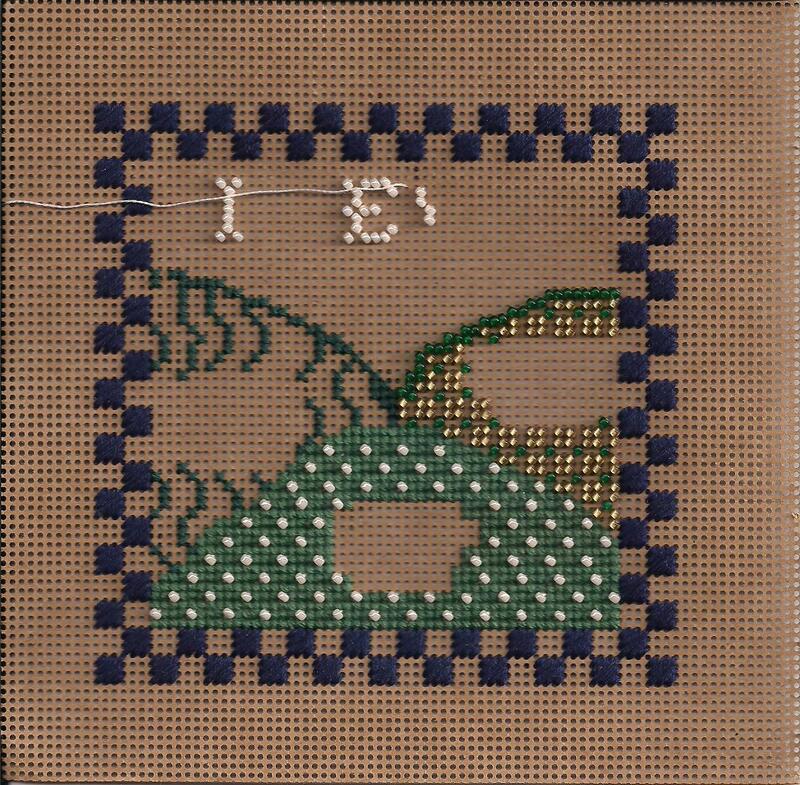 And I watched a video that suggested using Thread Magic. I had a container of Thread Heaven and I used it. I know there is controversy about using it, but I was desperate! I have been working on this block in the evening instead of starting a new Mill Hill bead kit. This will be a gift for my daughter, if I ever finish it! I have plenty left to do on this block and it will eventually be part of a crazy quilt. Jo over at Serendipitous Stitching hosts this SAL. We are supposed to post progress on things we have been given or are going to give as gifts. It is a great excuse to work on all those gifted projects. 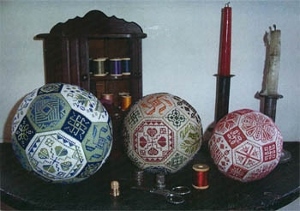 I am thinking about gifting one of these Quaker Balls to my husband's aunt. She is in her 90's and I need to get started! But do I have the right fabric? NO! The pattern is by Amaryllis Artworks. I have a friend who stitched one and it is lovely. One last thing: I joined the International Hermit and Stitch Weekend. Full explanation is HERE . I will be stitching on Reptiles as it is my weekend rotation piece. I will also be working on Uncle Sam's Hat. Yesterday was the full moon and it is time to post our ort containers. This great SAL is from Daffy Cat . It is fun to see the little snippets pile up. Jo from Serendipitous Stitching asked me how I make my postcards as I sent her one. I am working on a post about them and will share one I get it all ready. 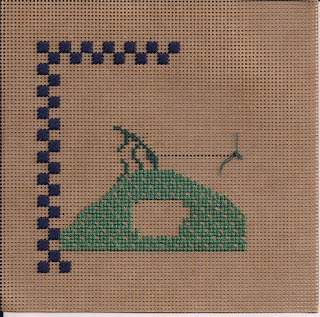 Well, I was working on my Drawn Thread Sampler and I realized I made the second house wrong. Sigh. But I am not taking it out! It is a little small but I don't think it makes that much of a difference. I have too much left to do on this and decisions to make in other sections. Keep moving forward! I decided I wanted to do a needlepoint project. This one called my name as I would love to have it stitched up before the 4th of July. I only stitched on it Sunday evening and this is what I got done. It is a kit I purchased from San Bernadino Chapter of ANG . They are a guild that I will never attend as it meets in California. But they offer great workshops at great prices. This one really called my name and has been in my stash a year, I think. The kit was well put together and the instructions are great. I even have some for making it into a hat. When will I stitch this piece in my rotation? Not sure. I need to pull Drawn Thread out and maybe cut some threads. Yikes! I figure if I stitch on it at least once a week, I will feel a little better about the project. To find out more about this craziness, look at Pintangle .This was all Sharon B's crazy idea. I have been slowly stitching on this piece. Most days it is less than 15 minutes and I don't stitch on it every day. But every little bit counts! I need to find some red floss for the red beads. None came in the kit, but that is ok. I have LOTS of red floss in my stash! Yes, I would recommend them. I ordered some with a friend. If I did not get the other sizes of milliners, I will be ordering some. The one I used was wonderful. I think I will be pulling out Reptiles. A friend and I were discussing rotations and I may be changing mine up next week. We will see. Have a great weekend!